Diablo III: Reaper of Souls just dropped and one of the features that came with it (or rather, the Loot 2.0 patch) was the “Community”. 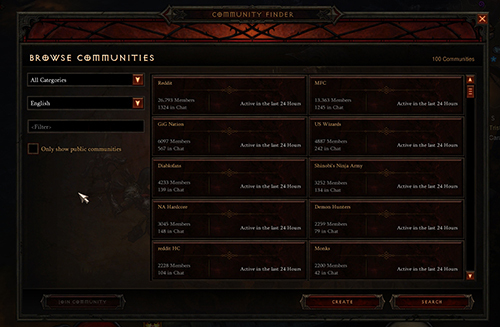 Communities in Diablo are social groups that users can create and connect to in the game. They operate similarly to clans in that they have their own news page, ranks and private chat channel but unlike clans, you can be a part of several at a time. Think of it like an extended clan that’s based around things that aren’t just about Diablo! There’s communities for people that read certain webpages, local town communities and anything else you can think of. I was excited to hear about this feature once I found out about it. I’m an extremely social person and the idea that I could hang out with lots of people who weren’t in my clan and chat about things was really neat. When you hop into game, go over to the bottom right of your UI and use the Communities button. (You can also access it by using default Shift + O!) From there, you can hit the “Find” button and start searching for any community you could think of by language, subject or filter by name. You could even start a community of your own. Some communities have a little envelope by their name, that means you need to be invited to join. You can apply to join and see if you’re accepted. Once you have joined a community, get to mingling! The easiest way to do this is to join a community’s chat. Now, at the moment, chat is not “stickied” to keep you logged into it whether you leave the game or not. It’s different from WoW in that respect, so you have to rejoin every time you log into the game. You could be missing important or fun stuff if you forget this, but I hope that this is a bug and they fix it eventually. This logs you into your community’s chat so you can see what everyone is saying. The little red icon means you aren’t connected. And if you want to leave for some reason? Just click that button again. As for my own communities, I started one for anyone who wanted a feminist/safe space to hang out and talk to people in Diablo III. It’s called “Sightless Eye” (which is what you’d search for in the Find panel) and has a handful of people right now. We mostly just shoot the breeze while demolishing demons, but if you want to come party with us, join! And just remember to rejoin chat every time you hop in game! See you in Sanctuary! I’m sure you’ve seen at least a handful of blogs that solely focus on how to make gold – they usually have some good tips to capitalize in various timely markets or are just too sketchy to really spend too much time on. I’ve always really avoided those places because while I like making gold, they always seemed to really require a whole lot of time and effort into making as much gold as possible. I feel that having tons of gold is great for the kind of large living like dropping hundreds of thousands on something dreamy, but the kinds of practices these blogs tout make having piles of gold as a sort of endgame in and of itself. What about the rest of us? While I like having enough gold to keep myself in the lifestyle I’ve grown accustomed to, a lot of people either do not have time nor inclination to make more gold their goal. I’m not very aggressive or a genius-level market prognosticator. And that in and of itself is why I called this the art of “gentle” goldmaking: it is making enough gold to comfortably get by without a ton of time spent on it or needing to know tons of math or analysis. More than that really, it is a simple set of tips that help you develop some good habits that will keep money coming your way regularly. All of this stuff is things I’ve picked up over time and are how I do business, and you might find all of this stuff irrelevant. Caveat to this advice: I have tried to make this as general as possible. Many servers have wildly different kinds of markets; some support a lot of people, some don’t. The best advice is just to try things out and see what works for you. One of the easiest ways to get into the groove of making money is to devote one of your characters to this very process. I know that some people are altoholics like I am and might not have room, but having a dedicated bank alt is a real lifesaver. My bank alt is a level 17 that originally started out in Vanilla to be a toon I was going to level with an ex-boyfriend, but once we split, I parked her in Stormwind and cleaned out her bags and she’s been my banker ever since. Any alt can be used for this purpose but ones that either have less playtime than your other ones (so they can stay near an Auction House and mailbox) makes this way easier. If you have an engineer, you can even use the engineering AH in your faction’s Shrine in Pandaria. The reason bank alts are so gosh darn handy is because storing most of your gold makes buying and selling things very easy, as well as helpful if you’re saving towards something. It also keeps everything you want to buy or sell in one place so you’re not searching all over. Over the years, my bank alt has gotten increasingly bigger bags and even a couple tabs of a bank guild, but that just comes with the territory if you start doing a high volume of auctioning. Mostly it’s just handy that whenever you are done for the day, or want to clear out your bags as you level, that you just send everything to your bank alt. Doing this really gets you into the habit of seeing everything as “sellable” and also frees you up to deal with it later. The first thing I do whenever I log onto WoW is check my bank alt – whether it be an auction house scan (we’ll talk about that later), collecting gold out of the mail or sticking up some new things onto the AH. Also known as my “sell everything that’s not nailed down” rule. Here’s probably one of the biggest lessons I’ve had to drill into my guildmate’s heads! Many people I know really don’t want to put in the effort of sticking things up on the auction house so they just vendor them; you lose out on so much more gold this way. The other direction to go in is to save literally everything and overwhelm yourself with things you might not ever need. Hoarding is a really terrible idea and even I have problems with it sometimes. It’s so easy to think, “Someone is going to need this” and stash it away, only to come back months later with things just hanging out in storage doing nothing. Get into the habit of sending all your stuff to your bank alt or putting it onto the Auction House unless you can honestly say it is earmarked for something specific you can think of. Alt’s engineering powerleveling? Yes, save that ore! Might need that cloth for a rainy day? Ugh, sell it! There’s always some value in putting something up now rather than saving for a nebulous future; very few things that are from a current expansion that sell for more over time. I know that the urge is strong to keep something to potentially use it and save yourself money but it’s often way cheaper to sell it while its price is still high and buy it down the road when it sells for a lot less. Clearing your bank and bags every so once in a while (like once a week or once a month) also gets you out of this cycle of keeping things around that you might never use and puts it into your pockets. As for vendoring, I know a lot of people say, “Well it’s not going to really sell for much on the auction house, so why bother?” Well, vendoring it for 20s rather than selling it on the auction house for 5G makes no sense to me. And 1G is always more than 0G. Vendor grey items and select few white items, and try to sell everything else. The only time I out and out vendor something I was trying to sell on the AH were things that either a) dropped below vendor price b) really just didn’t sell after months and months of trying. This idea that something has to sell “reasonably high” is another weird thing I see people talking about; it’s often a lot more profitable to sell a lot of little things for a little bit of money than selling one particular item for a lot of money. Why people don’t want to sell something for 20G boggles me – that’s 20G more than you had before. It all adds up over time. Every little bit of gold helps. This is one of the places where I feel a lot of of casual players get scared and shy away from the auction house “game” – the fact of the matter is AHing is really not very easy to do or intuitive unless you use add-ons. And who really wants to have add-ons for selling things? Whether you do or not is really up to personal choice, but I find that it has made it a lot easier to be slightly more competitive than not. It cuts down on the amount of time I spend doing things, allowing me very efficient. A good auction house mod basically cuts through the pages of listings and organizes them in a way that’s very easy-to-read, and depending on what you use, makes comparing prices for buying and selling a snap. Some people like heavier AH mods that give you deep market history but those also tend to use a lot of resources, so what I use is Auctionator. It gives me lightweight Buy/Sell tabs, and only saves AH data for items I buy or sell unless I specifically tell it to scan the entire market. I tend to scan the market once a day and that seems to serve me well. A good routine for me is getting up in the morning with my coffee and scanning the AH and then getting into listing/checking all my auctions for the day. See how easy that is to look at? It lets you set prices and stacks really fast and it lists them automagically one after the other. This makes adjusting what you are selling a breeze; buying is similar and you can even save shopping lists. But overall, just having that list makes buying the cheapest item very easy to see and it makes you sell things for what they should be selling at, not having to guess. A good AH mod is the baseline, but other things that help me get through the process of selling and buying are Postal (a very sturdy mailbox mod) and Altoholic (so I have item data for anything I have in my bags and what characters have what on them). These things are by no means necessary and just for my own purposes. But anything that saves me tons of right-clicking individual mails (I often have 300 auctions going) or wondering if my miner or my engineer has Ghost Iron bars is worth it. Whether you’re hunting a specific item to buy or need to know what you should be selling items for, I cannot strongly recommend The Undermine Journal enough. It is a very handy WoW site to visit if you aren’t in-game, or even if you are! It lets you see what are top sellers/”hot” items for your server, and gives you consise graphs for best days and prices to sell things. Do you have any professions on any of your toons? Professions are a pretty easy way to make gold, regardless of what you use them for. While some servers don’t have huge profits in top-end crafted items, selling raw materials from gathering professions or low level craftables works, even if they aren’t huge amounts of gold. I’ve made a bunch of gold on new servers that I have low level alts on just via mining or herbalism and selling whatever I collect. If you have more than one set of professions, you can even work in some synergy. Have an alchemist? Use a miner to farm up some Ghost Iron and transmute it into Trillium Bars. Gather herbs with an herbalist and send it to your scribe to mill – sell inks or glyphs. * A lot of times people use their professions to help the toon they are attached to but never think about using them for more. What I like to do is constantly send whatever I get on various characters to their “appropriate” crafters – all cloth goes to my tailor to be made into bolts and sell, or use for daily cooldowns. Ore gets send to jewelcrafter to get prospected, and so on. This is another one of those habits that getting into gets a process going and makes it all streamlined for you if you want to keep consistently making gold. Even just logging on and doing your daily cooldowns can net you cloth, gems, flasks or other things that you can turn around and put up on the Auction House. *A couple of places where people really get super competitive are the cut gem and specific glyph markets. Tread here carefully and maybe opt to sell inks or uncut gems rather than selling in a heavily trafficked set of items that people make it hard to sell anything. This hinges on that whole “sell everything that’s not nailed down” principle. The easiest way to make sure you sell things is to sell a little bit of everything. A lot of gold making blogs talk about “breaking into a market” or dominating a particular item on your server. Myself? I just sell whatever is in my bags most of the time. I don’t usually stockpile a lot of any one item (we’ll talk about this in the Risk/Reward section) and I just sell one or two things unless I really want to put effort into it. Mixing it up is basically how I keep myself interested and it also makes it less precarious, particularly if your server (like mine) has a lot of gold barons. Sometimes I sell cooking mats. Sometimes I sell legacy raid drops. Getting in and out of one particular thing that you sell and selling as many different things basically means one person can’t sink your whole operation and you reach many more buyers that way – whether they just need stuff for their raid that night, a particular item for their transmog set or crafting mats for their new alt. Another way to diversify is to capitalize on short-term buying. This does require a little more effort but doing things like keeping track of holidays and selling items related to them for a short amount of time is a great way to flush your coffers for a week or two. I’m sure you know the great Small Egg debacles around Winter Veil! Again, this requires a little more time/awareness of events in the future, so I don’t suggest it if you just want to do stuff day-to-day. Any attempts to make gold in WoW, no matter how casual, basically is a small level of risk. Increasingly higher risks in-game require a lot more gold in case you fail. Keeping your risk low by selling only what you have and selling it at “safe prices” is a very guaranteed way of never losing any money. Occasionally you will see no one selling what items you have and you can easily attempt to fill that gap and sell for a higher price. This is still low risk, in that if you don’t sell anything, you only lost your fees. Sometimes I see a lot of an item being sold way less than what it usually goes for and I buy it up. Sometimes I manage to sell all of it for a much higher price and sometimes I don’t. This is where risk is really involved. If you want to play it safe, this is a great strategy. But if you feel comfortable with your gold, you can make even a little investment go a long way. Capping yourself (spend only 50 or 100G on buying up items) is a great way to make a little more money. I’ve lost a bit of gold in some pretty foolish investments, but I still inject a little risk into my daily routine. It’s not re-selling engineering mounts for thousands of golds, but maybe it’s a battle pet for 10G more or a stack of herbs for way more later in the week. Try it! I know this is one of the hardest AH rules to master, especially for us gentle auction house users. It is very easy to get discouraged or impatient if something doesn’t sell right away. It’s okay if you take it to the vendor and sell it off. But for me, sometimes it really is worth it if you know you can sell something. You might have to relist it every day for a month but when it finally sells, it makes you feel great. That’s the best part of auction house stuff, that feeling of victory when someone finally buys your items! Caring about what you’re selling also helps out as well; it feels weird to suggest that, but if you like what you’re throwing up there, it makes the investment worth it. I got into the transmog game pretty early and put a lot more time into it than I really had into a lot of other things prior to. Sometimes you move up from just basic AHing when you find something you legitimately like collecting or watching people and that’s okay. Getting cool stuff to people for money is not a bad goal and it makes you feel like an expert after a while. This is the only non-general rule I have, and I feel that it probably applies to most servers, if not all. A lot of people log on on Tuesdays, especially if your server supports a giant raiding community. Putting your stuff up on Tuesdays means a lot of people are going to be logging on, especially after server downtime, to buy stuff they need for the week. It’s also the time of the week when most of the “weekend warrior” farmer prices have gone back up and you can make a bit more gold with hardly any effort. I like to sell all of my cooking mats and flasks and things that people might need weekly on Tuesdays. These are just some of my rules for some of you who are looking to just make some gold and have no idea how. Let me know if these things work for you! Hopefully they will and you can buy cute outfits or maybe some new pets or even just manage to pay for your repairs. Like I said before, how much effort you want to put into this is up to you and if you don’t want to follow any of these rules, that’s okay too! But I’ve made a decent amount of gold over my time in WoW, even if it’s not the mega-millions of some people. And I’ve done it at my own pace and with a bare minimum of energy and cutthroat-ness. Cynwise had a really useful post this week regarding warlock’s keybinds and the patch. In short, he basically advised to “trash it” – remove everything off your bars and start from scratch. I found the advice, while directed at warlocks (*nose scrunch*) to be really useful for mages as well. There really isn’t a DPS player that couldn’t stand to benefit from patch-related Spring cleaning when it comes to your UI. A lot of add-ons are outdated and broken, so it might be a good time for everyone to start everything from scratch. I decided for the benefit of other mages reading my blog, to give a peek behind the curtain as to what my set up is now that the patch has hit. You can click on this for a full-sized image of my screen. A lot of my add-on dependency was broken after I started using a UI package. Prior to picking up ElvUI (back when it was a fork of TukUI in Wrath), I had used a lot of cosmetic mods to do roughly the same things that ElvUI did all at once. I stopped needing tons of mods for every part of my UI and just could snap everything to fit. My add-on list went from 60 mods to about 20 or less. I know that ElvUI isn’t the choice of many people, but I have really liked how easy it is to use and the GUI has come a long way in being more friendly to first-time users. As someone who is used to configuring everything via /command, it’s been nice to see it evolve into something usable out of the box but with a high amount of customization. As you can see, I run a fairly “standard” looking UI and like having tons of screen real estate. I like having all my information down and center. My right side action bar is typically mouseover, and my other bars are hidden via mouse-scroll under my main number bar. My DBM timers sit in that space right of my timers/SCT, and then float underneath to right above my DoT timers. The box to the left of my player frame is CombustionHelper. My Skada DPS panel is hidden in combat. That is everything! It’s nice to keep a short list as patches usually break everything. Cynwise had the right idea about getting rid of everything. I had a lot more space once I did that as a lot of our spells went missing. Keybinds are somewhat of a herky-jerky exercise for me as I am a lady with very small hands and a normal-sized keyboard. Therefore, I tend to lean a bit more on mouse keybinds (via a Razer Naga) or single-keypress keybinds as combination binds often are too hard for me to reach or are uncomfortable. Is this something I need to use enough that it requires a keybind? We as mages thankfully do not have tons of spells for situational use so our woes are often not as problematic as other classes. I think I can be honest here – I have some abilities that I click. There’s just no good way for me to keybind these things without running out of keyboard/mouse options and they are not things I use often enough or on the fly (I don’t PVP on my mage) enough that it necessitates a bind. I know some people will flame me for that, but I am just not someone who has the hardware or hands for all the keybinds. People (often who have bigger hands) forget that some of us cannot use tons of SHIFT/ALT/CTRL modifiers for all of our abilities. If you use what it is comfortable to you to be repeatedly used, then you’ll be alright. There are some things you absolutely should keybind – survival/defensive cooldowns, main nukes and hair-trigger utility spells. Everything else is negotiable. Note: My Naga buttons duplicate the NUMPAD basically. *** = I don’t have Strafing bound, I use mouse turning and directional key binds to steer. Welcome to Part 2 of my lengthy saga of how I acquired the “Insane in the Membrane” feat of strength, wherein we make billions of cards and stab a whole ton of orcs. Where we last left off, it was the day of the Cataclysm pre-patch, wherein we met the dragon what come and blew fire and things. I had finished up both my Shen’dralar and Goblin rep that day, and now it was time to finish up the last two reputations. I was not expecting it to take another year and a half. It’s no surprise that Myth and I shared a Google Wave (remember that?) full of materials we needed for every rep and where we were at in all of the reputations. When <Sweet Cuppin Cakes> was started, I took over two tabs of our bank guild in order to order all of the decks and cards we had in individual rows, in numerical order so that it would be easy for me to see what cards we had duplicates of, which ones we were missing, and then turning all completed card sets into decks. There was also the matter of holding onto all these decks until the Faire came around that month. We’d race to the grounds and turn them in the first day, then attempt to sell off the trinkets to recoup money. There was also much spamming of Trade Chat to have people let us turn in their trinket decks for them just for the rep. This would have been easier if we were on a more populated server that wasn’t already overrun with Insane-grinders, I believe. Bank alt goes to AH, prices out and finds cheap materials for six different kinds of Darkmoon Cards via material shopping lists I built into Auctionator. Buy out herbs and inks as cheaply and in gross as possible (using AH pricing data), including many stacks of herbs that had no business being sold that low. Check bank guild for missing numbered cards. Check AH for said card shopping list using Auctionator. Buy any cards listed reasonably (although near to the end, the yardstick for “reasonable” started moving quite far) as well as cards on shopping list. Duplicates bought cheaply would be put towards future decks. Empty mailbox of herbs, primals, inks and cards. Mail materials to scribe. Take cards to bank. Order cards in bank using set/numerical layout. Turn any finished sets into decks. Set decks aside. Clear out glut of decks and mail even number to Myth and my main. Hop onto scribe and mill all herbs. Take inks and primals and make as many cards as possible. Mail cards to bank alt. Arrange cards into various slots in the bank guild. I am not exaggerating in the slightest when I say that I spent a lot of time and money on this particular part of our grind. The fact that anyone can achieve exalted reputation with Darkmoon Faire via dailies now is mind-blowing. I sunk in excess of 20,000 actual gold and countless more in gold-hours from farming, buying, and putting everything together. Near the end I was spending thousands a day and kept myself financially afloat by some of the other financial ventures I was into like soloing and making money via raiding. (Did I mention that I was still a progression raider throughout this grind?) But honestly, it was fun. It was fun trying to watch for deals and shop very smartly. This was the reputation that Myth and I spent the most time helping each other out with since we had gotten into this mess together. This was the final showdown and ultimately where I proved that I didn’t quite have the fortitude to finish as quickly as Myth did. While she crossed the finish line last year in September, I dawdled around until April. A lot of it had to do with the fact that Myth had already a rogue, but even when I had finished up leveling a rogue for just this purpose, I had so much more work to do. One of the ways to save a lot of time turning in lockboxes as simply grinding out Ravenholdt rep by killing swaths of Syndicate mobs in Alterac Mountains, Hillsbrad and Arathi Highlands. What she had done was do loops around Hillsbrad at the Lordamere Internment Camp killing the Syndicate there, but by the time I was ready to that, Cataclysm had hit and those mobs were gone. I did, however, find an alternate solution in Arathi – do loops around Northfold Manor and Stromgarde Keep. My rep sat between Honored and Revered for a very long time. I didn’t want to grind lockboxes, I didn’t want to pick off mobs for 5.5 rep a piece. Sure, I kept planning to. But other things came first or go in the way. I’d half-heartedly say that I’d do it but tab out of WoW and go AFK in Stormwind. All those things I would sit around talking in guild chat could have been times I was killing mobs. Eventually I did though and hit 11999/12000 Revered. Then I knew it was time for the hardest part: pickpocketing lockboxes. You don’t necessarily have to do it all yourself but if you want any control over the speed/process, you’ll want to. A lot of people buy lockboxes in bulk and if this were a bigger server, I might have been able to con a rogue into doing it for me. But given that I had wasted all the time leveling up a rogue to do it, I conscripted a couple guildies to help me for the last bit on their rogues (for some cool money) and did some of the grunt work myself. The two best places to do this are the Blackrock Stronghold (with the packs of quest mobs lined up) and LBRS. I chose mostly Blackrock Spire as it was an instance and I wouldn’t run into other rogues hoping to farm lockboxes as well. However, my farming fatigue is super high, especially after having done that marathon stretch in Dire Maul. Still, I plow through a couple days worth of loops around LBRS, watching Adventure Time episodes as I go. I have an amazing system down even: clear through the end of the instance, drop down one level from the end and re-pickpocket back to the beginning, reset the instance, and mail off 75 lockboxes when my bags get full. Within a couple days of guildie help (thank you to Relkir, Myth, and especially Trangie! ), I reach my goal and become Apple Cider the Insane. This was a test of my dedication towards achievements. What really made this fun though was the fact that I had a friend. Doing something this dramatic with someone I enjoy being around made the more lonely parts enjoyable. Is this a metaphor for life in general? I think it could be taken as such. Over the past 2 years or so, I’ve definitely burned out a lot of my capacity to sit and camp things, farm stuff up. It was a huge goal of mine on my “WoW bucket list” to complete this though, so I feel accomplished in that regard. Other people have done this with more brevity than I, but I don’t care. I got it when it was still “hard” and that’s good enough for me. I would never do this again, though. And I doubt that Blizzard is going to ever have a Feat of Strength like this again. They are moving towards a model of game that doesn’t require lengths this profoundly complicated to go through and most of the reputation changes have indicated this. All of the reputations now only require kill grinding or turn-ins or even dailies. While there might be another carrot dangled in front of us achievement crazies, I doubt it will ever be as sweet as this one. However, you bet your sweet bippy I’ll be finding all 10,000 waterfalls in Mists. I’ve written this guide before in various places, but it bore reposting here. It’s mostly WoW-specific, since most of us play WoW, but if people have specific questions regarding non-WoW harassment, you can contact me directly. I am here to discuss with you why harassment is never right, what you can do to help yourself, and with some additional, new information on writing tickets to get max benefit from GMs in-game. I know it is hard to think of just someone random saying or doing something stupid to you as harassment, but if it makes you uncomfortable, it is absolutely harassment. Sometimes harassment is isolated; sometimes it is on-going and continuous. Sometimes it is someone you know. A lot of times it isn’t. Maybe it is a former guildmate, a PVP buddy or a random level 1. Someone from your current raid team. Recent/former significant other. It can be anyone, it isn’t just people you don’t know. A lot of times it is people you know, and maybe even trust. Here is how Blizzard defines it: Blizzard’s Harassment Policy. Besides just being harmful in speaking to you, harassment can also occur if someone is trying to impersonate you for the purposes of defaming you or tricking people into thinking it is you. (Like rolling an alt with the exact same spelling of your name and trolling Trade Chat.) Harassment also incurs a harsher penalty if it is done in a public channel such as Local Defense, General, Trade or Looking For Group. This is the real crux of the process. First off, always take it seriously. If it isn’t clear to you what is going on, ask for clarification. But in most times, it is fairly clear that this is a serious attempt to make you upset and should be treated as such. I know we get a lot of confusing messages as women (and even as men) that we are supposed to take this “with a straight face” or that they are “just words on the internet” but I assure you that if they make you upset, you have the right to be upset and do something about it. So always take it seriously. Tell the person(s) that this is unwanted, very clearly, and ignore them. The only communication (which I’ll touch on in a bit) you should have with someone who does this or says something gross or rude is to tell them that this is unwanted, tell them NO! and to stop. And then put them on ignore. That is the only interaction you should have with them if they are harassing you. I know it is super-tempting to fight back, to troll them, show you’re not upset, but it is not helpful when it comes to eventually ticketing to GMs. Be short, clear and put them on ignore immediately. If they are someone you know – take them off your friends list, take them off RealID, and if it is someone in your guild or raid, alert a trusted officer immediately that this is what you did and why if it will cause problems for having someone on ignore. That message was rude and I would like you to stop. Do not contact me again. This conversation is inappropriate and is not to continue. Please do not contact me further. Putting the person on ignore is pretty much what I’ve gotten boilerplate from any GM I’ve spoken to in-game, and it is very solid advice. Why is this? Because putting someone on ignore who goes around to circumvent it (escalating the abuse) on a level 1 or another alt only incurs a lot more punishment. It also shows that you made every good faith attempt to resolve the situation yourself (in a very neutral way) and it didn’t work. If harassment stops here, great! A lot of times it doesn’t, however. Even if something is a one-off attempt to harass you, always document it. Document every single time harassment occurs to you. 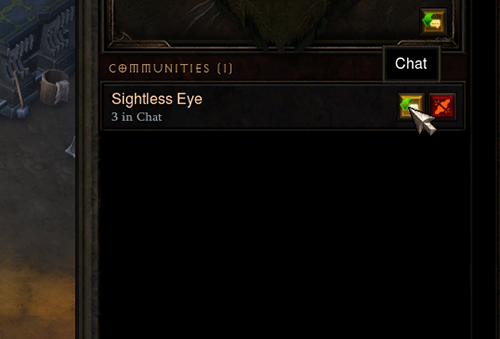 Enable chat timestamps in-game or use a chat mod (Chatter, WIM are two popular ones, especially for tracking whispers) with time-stamps and the ability to read whispers or other channel messages clearly. My personal favorite is that I create a chat window specifically for whispers – Go to your general chat tab, go to “Create New Window” and label it “Whispers” and then when it is created, go to the tab > Settings, and only check off “Whispers” and “RealID” whispers. This makes is easy to isolate whispers and realID messages. It is very, very important when it comes to reporting harassment that you have documentation for every single time it happens if only because knowing who said what, when and where can be crucial in creating a case for someone. Take screenshots for your own records if you have trouble remembering things or if you do not have time to sit down and write a ticket immediately. While GMs do not usually accept screen-shots, it is good to keep it in case this goes outside of WoW as well. Chat mods are also really helpful in that they allow you to copy-paste any chat text (even channels like Trade) into a ticket. This is where it gets a little confusing and scary! Ticketing a GM is hard sometimes because it feels very serious and what if nothing happens? Trust me, things will happen. But making a GMs job easier will make the process even smoother. Some key things to remember here in terms of what to actually SAY will be easier if you remembered to document. Ticket harassment every single time it occurs. Every single time. As soon as you possibly can. Lumping up a bunch of incidents or waiting may seem like a good idea to “prove” that someone has been a big deal but GMs have their own way of tracking this. So making tickets clear and precise about every single incident makes their job easier. Reporting it often and early makes it easier to track. ALWAYS INCLUDE: Character name, time and date. If you can’t ticket when the harassment immediately occurs (which makes finding what was said easier for GMs) including these things makes it easier to track and find. These are the most essential pieces of information for a GM ticket and almost everything else is not important. Only other pieces of information that you should possibly include other GMs you have spoke to (if this is continuous), if this message was spoken in whispers or a channel/guild, and that you put the person on ignore. If this is on-going, clearly state that this is on-going harassment. That’s it. Don’t include what you were doing, or any extraneous information. This just makes it harder to figure out what was going on. I received a harassing whisper from Bloobloo (Cenarius-PVE) at 4:50 AM, on 7/26/2011. This person has contacted me before. I have put them on ignore but they rolled a level 1 alt. I spoke to GM Stradavarius prior about this. This is on-going harassment. Dumbdumb (Saurfang-PVP) was trying to impersonate me in Trade Chat, using sexually explicit language at 3:45 PM, on July 27th, 2011. I have put them on ignore. Since the last time I wrote a harassment guide, Battle.net now has the feature to include any and all tickets you file under your Battle.net account (which is why is a good idea to report harassment from the same battle.net account if you happen to have more than one) so that you can see what you said, when you said it, who answered it and what they said. It also means you can screenshot your page in case you need to take this outside of WoW. Notice that there is a spot for images, so if you would like to attach a screenshot, I suppose that is where you would do it. To find your tickets on your Battle.net page – log into your B.net account, go to the Support Tab, and then Tickets. It has all of them listed there. After you have reported (and every time you have reported something), you will have that ticket show up there as well as receive an e-mail saying the same thing. What happens if you get a boilerplate auto-message from a GM regarding harassment or a auto-response that doesn’t seem to apply? It could be that your ticket wasn’t clear on it being harassment. Re-ticket. Keep ticketing until you talk to a GM. This is important. You are important. However, writing clear tickets is a good way to get a good, fast GM reponse. Well, hopefully it stops. GMs can’t tell you what happens, obviously, but know that you reporting makes it more likely that these dumbheads get caught or punished. It is likely that you are not the only person they feel like targeting if they are repeat offenders and it will catch up to them. But continue putting people on ignore, ticketing and remaining calm. If this moves into non-WoW related harassment, knowing the statutes regarding harassment in your state or the states involved is good. Getting in touch with the police to report the harassment and reminding them of these statutes, also good. But be aware that a lot of people still don’t understand how internet harassment affects you. It was my own personal experience that the police sometimes don’t take you seriously unless the person is up on your doorstep with a knife. However, reminding them that you use the computer every day means that this person IS on your figurative “doorstep” when they actively comment on the things you do. Keep trying and don’t give up. Getting a police report down is a really good step if you have to move forward into legal action or restraining orders. If the person goes on to post your full legal name, your address, your Social Security number or other legally identifying information about you, as well as concretely stating they are going to do something to you, this is a THREAT and needs to be reported immediately to the police. 1.) Always take it seriously. Like I said before, I know it’s our “assumed” place as women to just brush things off, to not get emotional about it. It’s your life and you don’t deserve it. You are an important, worthwhile person. Whether it’s whispers or trade chat or things people say in cross-server PUGs, always take it seriously. People who try to hurt you with words are in the wrong. 2.) It’s not your fault. Telling other people might seem antithetical but I have to personally say having a strong friendship network is a way to escape the misery from someone invading your life, especially if this is someone you are close to or personally know. A lot of times, people try to shame you into being quiet, hurt, and having friends have your back can do wonders. Having someone to just listen to you vent can make the process easier. And always know that a lot of us in the WoW community are open to listening and supporting you too. You’re never alone. There’s always trusted officers in your guild, GMs, your friends, your family, your pets and the police. Have faith. This won’t go on forever. Trust me. If anyone ever, ever wants to contact me privately regarding this post or about WoW harassment, I can be contacted. What if someone I know is being harassed? It is unfortunate that we have to write these sorts of posts. It is unfortunate that people have to go through this. It is doubly unfortunate, as evidenced by comments I’ve seen at WoW Insider, wow_ladies, that people still like blaming a harassment victim. No one deserves this abuse from people. Blaming a harassment victim is disgusting and wrong. There’s often a lot more at play than just “putting someone on ignore” or “stop letting someone’s words affect you” or that “it’s just a game.” It isn’t just a game. It is people saying very real, hurtful things to another person. It is using someone’s emotions and experiences against them, and over what? Something they said in-game? A real or imagined slight? A fight? Just because they are gay/woman/person with disabilities/a certain race? It’s NEVER okay. Never, ever, ever! If you think that harassing someone in-game is a good way of “getting back at them” – just stop. It’s not. Grow up and find a productive outlet for your anger. And it can often have very real legal consequences if you take it too far. If someone tells you to stop talking to them, respect them. Harassment will not end until the end of human malice, unfortunately. What we can do is educate ourselves, support our fellow peers and practice safe and respectful Internet behavior – respecting people’s privacy and autonomy, assisting our friends and supporting them, and knowing that there’s help if we need it.